In 2015–16, almond production was valued at $699 million (LVP). There are several almond varieties grown in Australia. The most popular include the Nonpareil, Carmel and Price which are sold in a range of forms, including in-shell, raw kernel, and as roasted and blanched products. About three quarters of Australian almonds are exported, going to 50 countries, with India the most valuable export country and Europe the largest buyer by region. The Australian almond industry is concentrated along the Murray Valley in Victoria, SA and NSW with an orchard recently commencing production in WA. In total, almond trees cover 40,000 hectares. The industry is undergoing an expansion phase, and when current plantings are mature in 2025 production is expected to reach nearly 130,000 tonnes. More planting is planned. 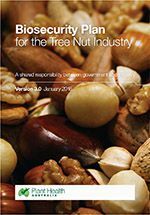 The almond industry is covered by version 3.0 of the nut industry biosecurity plan and the Orchard Biosecurity Manual for the Almond Industry Version 1.0. Biosecurity planning provides a mechanism for the almond industry, government and other relevant stakeholders to assess current biosecurity practices and future biosecurity needs. Planning identifies procedures that can be put in place to reduce the chance of pests reaching our borders or minimise the impact if a pest incursion occurs. 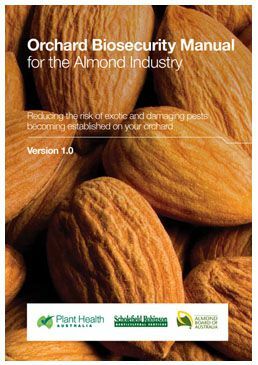 The Orchard Biosecurity Manual for the Almond Industry contains information to help producers to implement biosecurity on-farm. Manuals usually contain an overview of biosecurity, fact sheets to identify the high priority pests of a crop, tips on crop management, and how to manage people, vehicles and equipment to minimise biosecurity risks. Manuals also contain a biosecurity self-assessment list, and templates to record pest surveillance records and visitors. Promotional item to support the exotic plant pest hotline 1800 084 881. 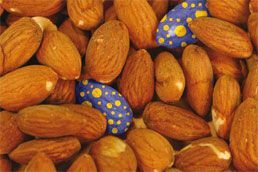 The following is a list of high priority exotic pests of almonds. These pests were identified during the development of the Biosecurity Plan for the Tree Nut Industry in consultation with industry, government and scientists. They have been assessed as high priority pests based on their potential to enter, establish, and spread in Australia (eg environmental factors, host range, vectors) and the cost to industry of control measures. 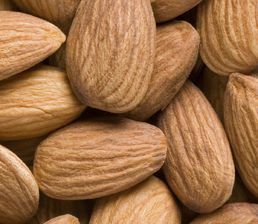 The following is a list of documents for other exotic and endemic pests of the almond industry. Please note that this is not a complete list of pests: rather it includes pests for which documents exist in the Pest Information Document Database. Some of the documents presented here are not tailored to the almond industry and are included for information only.